The development of a modern autonomous vehicle requires that the behaviour of the car is validated and verified in a large number of driving scenarios. These scenarios cannot be driven in the real world - except for the time it would require, it is virtually impossible for many scenarios to be repeated (e.g. reproducing the exact position of cars in an overtaking maneuvers or reproducing exact weather conditions for driving through fog, snow or rain). Testing and validation will rely heavily on simulation and there is a growing number of simulation tool providers. However, these tools have to be integrated with each other, the system under test and additional components. Most of these tools have proprietary interfaces to connect to and building up a system would require m:n connections between tools. What is needed is a common standard that enables automotive companies to easily setup simulations with the system under test and simulation tools. Over the last months, the openADx initiative was created to address this exact problem. 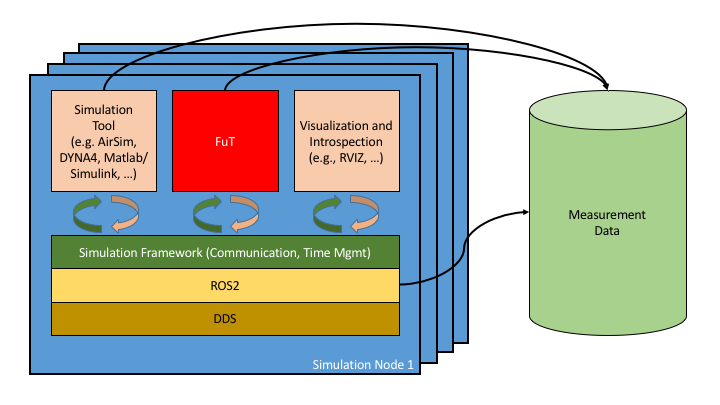 The idea is to create an architecture / tooling / Eclipse working group that provides a solution to this problem in two test bed candidates: Candidate 1) addresses a common simulation framework that tools and systems under tests can connect to and Candidate 2) addresses the management of data that is collected during the run of the simulation. This approach has been discussed in 4 workshops (results available at https://wiki.eclipse.org/OpenADx) which drew more and more attention from different companies over time. The last workshop near Stuttgart had interesting presentations from companies such as Bosch, Bosch SI, Renesas, Red Hat and the Eclipse Foundation. The next step of openADx will be to set up a more formal organization, so that many aspects of IP, infrastructure etc. can be handled in a way that is required by industry-ready projects. The favourite option is to initiate an Eclipse Working Group, since the Eclipse Foundation provides the required processes and infrastructure. Seeing the domain of simulation as one of the critical domains in automotive, itemis is going to participate in the Eclipse Working Group. itemis has strong expertise in model-driven system- and software engineering. We expect that the definition of a common communication framework is the first step. An additional step will be a common mechanism to describe the artefacts that can participate in a simulation and their characteristics (e.g. interfaces, timing requirements, QoS attributes). Having built a lot of modeling languages and tools with these attributes (such as e.g. Franca from Genivi, AUTOSAR tools based on Artop) we hope to bring our expertise to the working group.